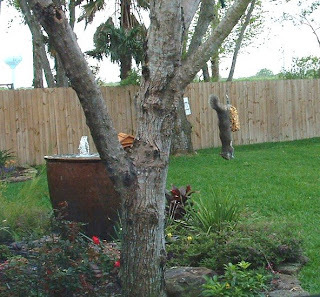 The picture I have posted is one of our critters in the garden with his own eating and exercise style. He hangs upside down and eats. When he wants another bite of corn he does his form of a sit up to reach the food and then goes back down to eat. We can learn so much from watching life in the garden. I know it has been a while since I have posted a newsletter. I apologize to all of you. My life has been full of challenges and I have needed the time to go inside and process what life has been bringing to me lately. Or another way to look at is what and why have I attracted these occurrences to my life at the present time? One of my core issues that kept coming up is that when I wanted time for myself or even to do something just for me I thought/accused myself of being selfish. Boy that early programming is hard to put aside. The very thing I have needed to do in order to process and stay quiet inside I considered “bad’ therefore putting myself in a catch 22. A few mornings ago I woke up and found a message in my E-mail relating to my very issue. Isn’t it great when we get the answers that even have only thought about? "One of the last things any of us want to be called is 'selfish.' It has a very negative connotation in our society. We often end up doing things we don't want to do to avoid being considered or seen as selfish by others. • We 'expect' others to give themselves up for us. • We make others responsible for our feelings of pain and joy. • We get angry at others for doing what they want to do rather than doing what we want them to do. • We consistently make our own feelings, wants, needs, and desires most important without also considering others' feelings, wants, needs, and desires. • We believe we are entitled to special treatment, as if life and the world owed us something. • We take care of our own feeling, wants, desires, and needs rather than 'expecting' others to take care of us. • We support others in doing what brings them joy, even when they are not doing what we want them to do. • We show caring toward others for the joy it gives us rather than out of fear, obligation, or guilt. • We have the courage to take loving action on our own behalf, even if someone gets angry with us. For example, we go to bed early because we are tired, even if our partner gets angry at us for not watching a movie or TV show with him or her. • We have the courage to speak our truth about what we will or will not do, and what we do or do not feel, rather than give ourselves up to avoid criticism, anger, or rejection. Giving ourselves up to avoid being called selfish is not self-responsible - in fact, it is manipulative and dishonest. When we give ourselves up to avoid criticism or letting someone down, we are trying to control how others feel about us. Taking loving care of ourselves, with no intent to harm another is self-responsible. Yet we are often called 'selfish' when we take care of ourselves in this way. Therefore, it is important for each of us to define selfishness and self-responsibility for ourselves so that we are not dependent upon others' definition of it and us. When you become secure in knowing that you not only have the right, but the responsibility, to support your own joy and highest good - with no intent to harm another - then you will not be tempted to give yourself up when someone tells you that you are selfish for not doing what he or she wants you to do. When you are secure in knowing that your own intent is a loving one toward yourself and others, you do not have to manipulate others into defining you as caring by totally giving yourself up." You may notice that when we speak quickly, without thinking, or rush to get our ideas across, our words don't carry the same power as when we speak slowly and confidently, allowing those receiving our words time and space to take them in. When we carefully listen to others before we speak, our words have more integrity, and when we take time to center ourselves before speaking, we truly begin to harness the power of speech. Then our words can be intelligent messengers of healing and light, transmitting deep and positive feelings to those who receive them. Laurelle writes “This morning I awoke to inner whispers "Reiki hour...Reiki hour...Reiki hour...ask them...ask them....ask them...Reiki hour." Sunday night(s) at 9:00 p.m. in their local time zone Reiki practitioners turn off all non-essential lights, and we become the light. First we telepathically connect with one another using the distant Reiki symbol, thus becoming one united light. Then we send Reiki with the pure intention "Peace, Love, Health, Prosperity and Well-being for all beings." At the same time we visualize a world at peace and the earth returning to a healthy state of balance; see the air, streams, rivers and seas being cleansed. For those who wish to participate, this can also be a wonderful way to personally receive a Reiki treatment at the same time. Simply be open to bathe in the energy as you are sending Reiki out. Group sessions of this nature enhance the strength of Reiki's healing power exponentially. So as those inner whispers encouraged me to do this morning...I am asking... Will you please join us for Reiki hour at 9 p.m. Sunday night? That is 9 p.m. in your own time zone and we will create a wave of Reiki energy across the planet. We plan to do this every Sunday night for the immediate future, and perhaps beyond. We hope you will join us. 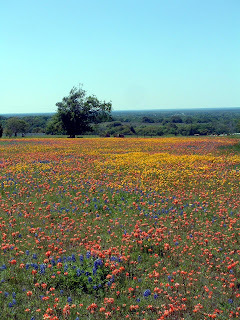 Here is a picture of Texas wildflowers taken this weekend, Yes I went away and had fun!